↑ Kramarae, Cheris; Spender, Dale (2000). Routledge international encyclopedia of women: global women's issues and knowledge. New York: Routledge. p. 746. ISBN 0415920906. 1 2 3 Autumn and Taylor, Verta, and Leila Verta. 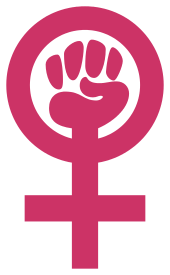 "Women's Culture and Lesbian Feminist Activism: a Reconsideration of Cultural Feminism." Taylor, Verta; Rupp, Leila J. 1933. The University of Chicago Press. Oct.-Nov. 2006 . ↑ Frances Chapman, "goodbye", Off Our Backs, Vol. 1 No. 19 (March 25, 1971), p. 14. ↑ Elizabeth Diggs, "What Is the Women's Movement? ", Women: A Journal of Liberation, vol. 2, #4 (1972), pp. 11-12, 20. ↑ "A Kiss Does Not A Revolution Make", Lesbian Tide, Vol. 3 Issue 11 (July 1974), p 10. 1 2 Donovan, Josefine. Feminist Theory. 3rd ed. New York: The Continuum International Group, 1985. ↑ Levine, Amy-Jill; Blickenstaff, Marianne (2004). A feminist companion to the Acts of the Apostles. London: T & T Clark. p. 242. ISBN 0-8264-6252-9.